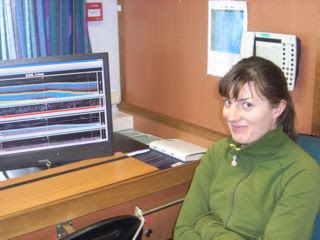 Today was a decent survey day and much work was done by both shifts through day and night - with the echosounders backed up by several fishing sets. 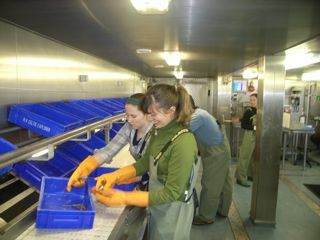 Much was learned about the distribution of juvenile Atlantic cod and pandalid shrimp. 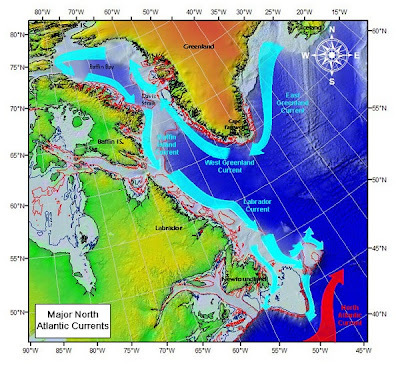 Surface water temperatures in the study region reached -2.1 C – the infamous southward flowing Labrador Current. Some cold! 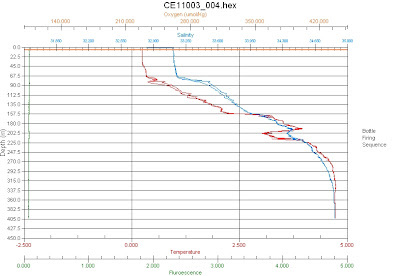 CTDs (conductivity, temperature and depth) recorded from the Celtic Explorer show that this cold water does not extend below 200m, with a warm lens of Atlantic Ocean water with temperatures above 4 C occupying the bottom hundreds of metres in this region. Most of the fish in this region prefer the warmer waters and in winter are found there. 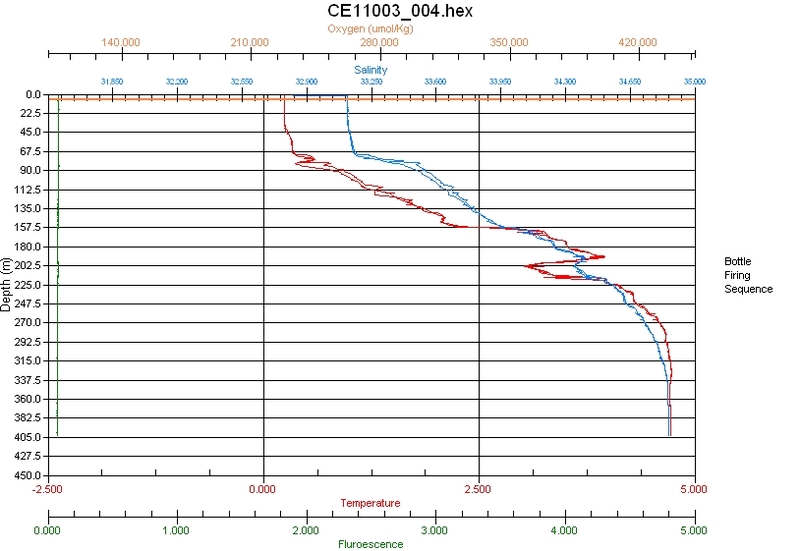 CTD profile of temperature and salinity off Labrador. Meanwhile, the sampling must continue ….. The night shift sampling – graduate students Livia Goodbrand, Laura Wheeland, Craig Knickle and Kate Barley (doing double time from the day shift) at work (photo by Ricoh). Back in the dry lab, the steadily growing database is monitored and quality checked …. Unfortunately, the respite from harsh weather lasted only about 12 hours, and tonight the expectation is hurricane force NE winds – the worst kind in these waters – with seas expected to rise above 10 m!! Based on expert advice from our Newfoundland fishing master, Captain Cecil Bannister, we are heading for cover, discretion by far the better part of valour. The nearest ice free port is the northern Newfoundland town of St. Anthony (near the green blob on the map), the home of the famous Grenfell Mission, which served the coast of Labrador and northern Newfoundland for many years. Close by is the ancient Viking settlement at L’Anse aux Meadows, where Eric the Red visited some 1000 years ago from Iceland and Greenland and perhaps established the famous Vinland (it was warmer then). These are also the waters first fished for whales and cod by adventurous Basques in the late 1400s, and then by French and English adventurers and fishermen thereafter and by Newfoundlanders and Labradorians to the present day. The most easterly region and Province of Canada - Newfoundland and Labrador. The Celtic Explorer is now heading from the Labrador Sea to the safe haven of St. Anthony, near the tip of the Great Northern Peninsula. The Labrador coast is closer, but wind driven ice blocks the way. 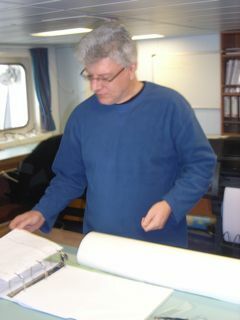 Dr. Rose has been interested in the history of this region of northern Newfoundland and southern Labrador, and their fisheries, for many years. He did his doctoral thesis on the cod and capelin fisheries of the Labrador Straits region, and witnessed the early archaeological explorations of the 15th Century Basque whaling station at Red Bay in Labrador. We will likely be harbour bound for the next two days until this fierce winter storm subsides. Time to organize the collected data, read, and perhaps finish outstanding papers and project proposals. 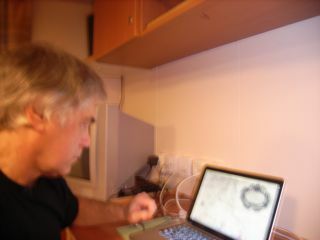 The important thing is that we will be safe in a snug and historic harbour in northern Newfoundland.